Dogs love bones and pet owners want their pets to be happy, but are they really worth the risk? It depends upon the dog's chewing habits, type of bone given and length of time gnawing on it. While some older dogs may enjoy gentle gnawing on a bone and can benefit from a hard chew such as antlers, many young pups are aggressive chewers and would be best served with a hard rubber toy stuffed with healthy food (e.g. freeze a Kong ball with dog food). Some veterinary nutritionists advocate raw meaty bones and while there are nutrients in them, there are also pitfalls. Raw meaty bones (especially ones containing marrow) can be high in fat and lead to diarrhea or pancreatitis in some dogs. It may be safer to give your dog those nutrients in the form of raw frozen or freeze dried diets such as Instinct, Stella and Chewy's, Primal and other brands. There are 3 major risks associated with dog bones and chews. The manufacturing process can leave trace amounts of toxic chemicals on the bone or chew that can be harmful for your dog. Many chews are processed using such chemicals as: bleach, hydrogen peroxide, artificial colors and preservatives. All can be toxic for your pet to ingest. Also, just like with other foods, there's a risk of a food borne illnesses (such as Salmonella or E. Coli) from dog bones and chews that could put your pup and yourself at risk. A dog may be sensitive or allergic to the the type of bone or chew or something used during the manufacturing process. Your pet may experience stomach upset and diarrhea. 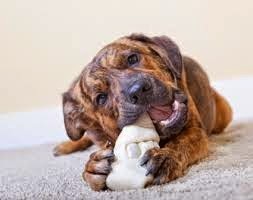 Perhaps the biggest risk is when pieces of bones or other edible chews become lodged in the throat or digestive tract. The pieces can cause your pet to choke or they can get stuck, requiring surgical removal. Do not allow your dog to chew on a bone unsupervised. The risk can vary, depending upon how your dog chews bones, thetype of chew or bones (Steamed and smoked bones are very brittle) and their age. Some dogs tend to scarf down anything and everything and may swallow large hunks of dog bone whole which can be very risky! Or they may be an aggressive chewer and cause damage to their teeth or gums. Raw, "meaty" bones --often advocated by holistic vets and nutritionists. Some pets do better with these than others as too much can lead to pancreatitis and diarrhea due to the very high fat content. Should I Give My Dog A Bone? Ask Ariel is not an advocate of giving dogs chew bones as there are just too many reports of pets getting sick from them. That is not to say that nutrients from bones are not essential for dogs--quite the contrary. But, the safest position is to give your dog the benefits from bones in the form of raw frozen and raw freeze dried diets which contain ground bones.